Leukemia is scary. No matter how you explain the chemo, remissions, relapses, percentages, etc. the reality remains that in response to our 2006 treatment, this disease hibernated for over a year before re-attacking Jaymun. ...in this case LSC's (Leukemic Stem Cells). LSC's are where Leukemia "lurks", gathering strength for the next attack. 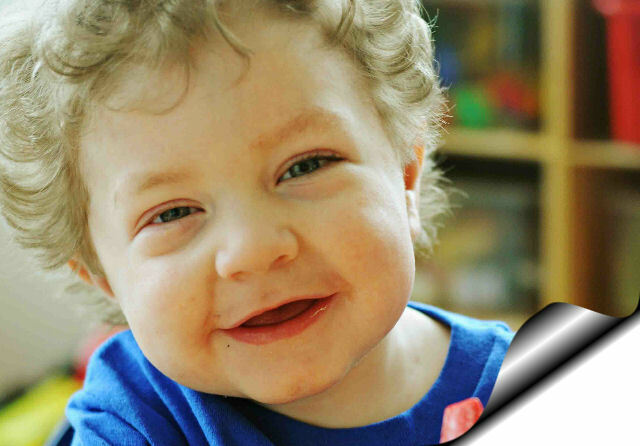 (Leukemic Stem Cells) as they slowly execute their sinister scheme to rob us of our dear boy. 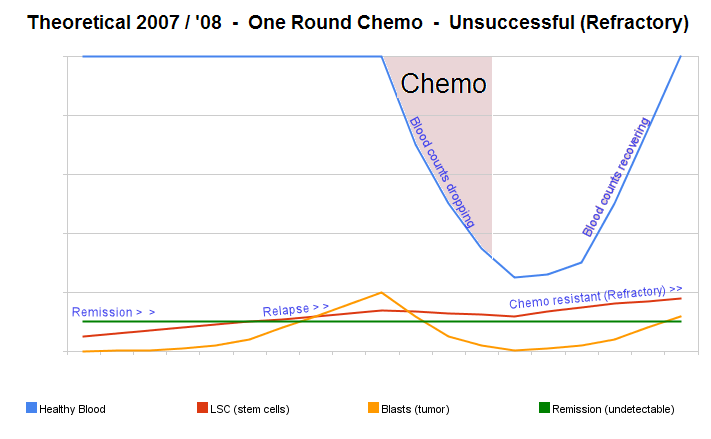 The green line shows the "hide out level" (remission) under which they can evade detection. ...the healthy blood recovering, and the cancer dissappearing under the green remission line. We enjoyed 14 months with clear remission radar, unable to see what was smouldering underneath. Yet there remained an insiduous, undetectable red line of LSC's lurking, growing, as a seed colony that replenished the "blast factory" we have going on now. Our current chemo treatments all target the yellow line, and leave the red line relatively unscathed to continue it's slow but steady assault. Not only do LSC's inch along their menacing way, they spawn new cancer inside the house after the door is closed and bolted with treatement. Repeat relapses are more dangerous, and remissions harder to secure. Some AML patients (about 50% of them) are fortunate enough to get the LSC's destroyed with their first treatment(s). Then they are "safe". 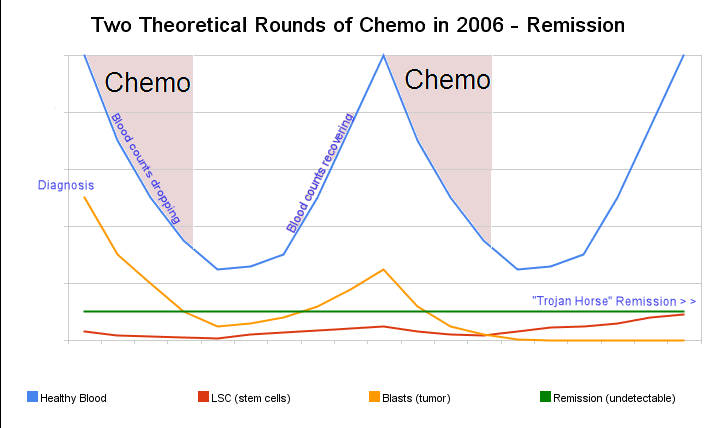 However, for rest of us, the "red line" smoulders until cancer springs above remission radar. Then, once the first relapse chugs, the LSC locomotive picks up steam with future relapses coming quicker and harder - eventually no amount of chemo able to salvage remission. That is called refractory disease. We had a marvelous year (2007) in remission. I wish I could press "rewind" and do it over a few times. It is horrible to see our dear Jaymun struggling through treatment that keeps failing. At this point, the medical outlook is bleak, and I am afraid what will happen as his CNS numbers are steadily creeping up. It would be dreadful to watch him suffer his final months through leukemic meningitis, or in a morphine fog. We see the devastation of other families new to the "Hot Unit" here at CHW - and we do not know what to say. When they discover they have some other more treatable form of leukemia, I feel like smiling and saying "you are lucky!" Because with Jaymun being only the third ever diagnosed in Wisconsin with congenital AML, we started out with a 30% chance, and would rather loved to have heard numbers like 80% or 90%. Today, with Refractory, Relapsed, Congenital Acute Myeloid Leukemia - we are not given a percentage. I do not think there actually are any statistics for us. What do we have - 1/2% ? I am not depressed. I am simply trumpeting a medical Code Blue! Now is the time to employ aggressive "anti-LSC" weapons before it is too late! Let's not follow failed methods to the grave! God is already working. There are active researchers - people in the mercy business - the heros God uses to combat lethal, lurking, LSC's. His team is "hot on the trail" following leukemia home to its LSC lair where it "sleeps at night". Not suprisingly, what has potential to be one of the most powerful anti-leukemia weapons is not some exotic drug, but something God provided in a common daisy: FeverFew (or Bachelor's Button). I believe thousands of people (even those with other cancers like breast or prostate) will be blessed because of the work Craig is doing against leukemic stem cells. He and his team are catching cancer napping - cutting out the root. The challenge here for Jaymun is that the medical substance developed from FeverFew (DMAPT) is still in manufacturing. Also - the doctors do not want to "spoil" their clinical trial. Supposedly "jumping the gun" (using DMAPT) prior to the clinical trial, could jeopardize their careful work because the drug developers would "chicken out" due to later liability if there was an earlier poor result. Even if the FDA rushes the approval for DMAPT, the clinical trial is set to begin in England, and it will be comprised of adults only. I refuse to accept that for my son. There must be some way!!!! Jaymun is about as high-risk an AML patient there is. Congenital AML has the scariest outcome from the start. In addition, he relapsed - and is currently refractory in both his CNS and marrow after several rounds of salvage. There are "phase 1" clinical trials open - but nothing that I can find with even a small percentage promise of survival for refractory, relapsed, congenital AML. That is why I am looking at things the doctors do not currently offer: pre-phase 1 therapies. "saviour zones" that could not be used against them later in court. That way they could conduct "liability free" early "trials of one" while performing emergency rescue of the most helpless. Early successes would boost motivation. Early failures would help tweak clinical trials before they even started. Science would move faster. Kids like Jaymun would have a better chance. I do not want my son to be just another number filling out a current study that already proves 99.9% of patients like him die horribly. If that is our only option, then I will try to figure out some way to administer FeverFew tea to him and hope and pray I get the right dose (?) of parthenolide into his blood (?) in the first place, and in his blood long enough (?) to be effective. However, I am not a doctor, I am not trying to play Superman, and I would sincerely like real doctors and researchers to take the time to help this little boy with a promising therapy without worrying about getting sued later if it fails. They might even learn something that could help other little children. What do they have to lose? ...laying helplessly in a hospital bed depending on good people to do what is best for his life. His body can't take much more chemo. He has no white cells. He is septic for six days already. His CNS blasts were rising, and we have already skipped two taps (and chemo treatments) because of his sepsis. I think we cannot wait for the blasts to come back, before we go after LSC's. We have to go after them now. I mentioned that Jaymun is the least powerful. We know God is the most powerful so we asked God to help us. Many times God helps by having the right people get the job done. to rescue the life of a little powerless boy?